This signature cocktail from an award-winning English vodka producer makes a brilliant welcome cocktail. Guaranteed to instantly put everyone in a celebratory mood. 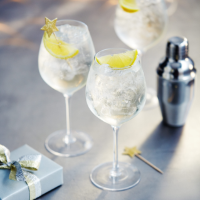 Pour the vodka, elderflower liqueur and soda water into a large ice-filled wine glass. Garnish with a lemon wedge.